The prestigious Italian architecture journal The plan has published in its last issue a review about the European University of the Atlantic student residence in Santander (Spain). A recognition that its architect, Carlos Galiano, has received with enthusiasm. “It is always satisfactory when a project in which you have invested a lot of work and effort is recognized and valued by other sector professionals”. This building, located at the Scientific and Technological Park of Cantabria, 400 meters away from the European University of the Atlantic, campus, is divided in two blocks –of 2 and six floors– united by a transparent and bright glass module. The first one is located in the main access, it hosts 70 individual and shared studios which are 28 y 45 m². The second one has 42 shared apartments with 4 bedrooms of 115m2 each one. 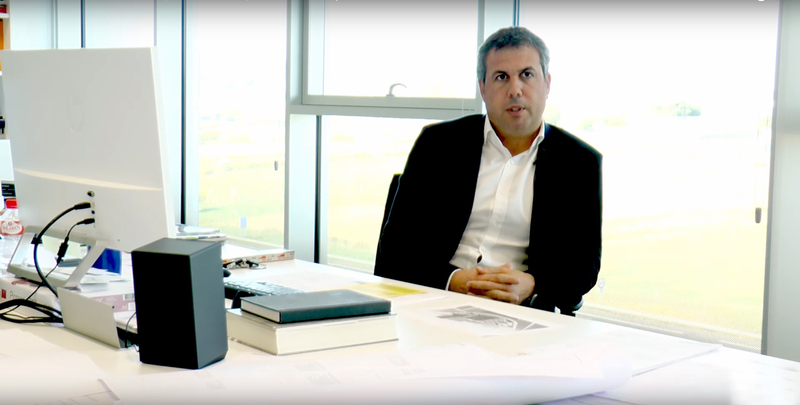 “In architecture it is important to know well the environment conditions, as well as assessing and studying the customer’s needs to solve them with excitement and passion”, with these words Galiano defines the creative process that lead him to design the UNEATLANTICO university residence. “Honestly, I believe we can be very proud of the result”, he adds. This building, he says “is a bet for the contemporary architecture”, where wide, friendly and bright spaces are the real main characters. “Big glass spaces, with bright and clean geometries are the main ingredients of this project in which the objective was to achieve the maximum comfort”, he concludes. Carlos Galiano at his office of the third floor of the main UNEATLANTICO building. The European University of the Atlantic student residence has a total surface of 15.573,14 m², with a capacity for 340 people and it has involved an inversion of 17.043.254 euros. Since this September, it is already operational and there are many national and international students enjoying its facilities. If you are interested in reserving your place for the 2018-2019 course, contact us by phone: 942 948 020.